Few years back when 4k was new, all the limelight was on resolution. Marketers and salesperson would talk about grandiosity of a bigger 4k TV, how it compares to Full HD or HD or the rudimentary SD definition. But as the economy of scale have started to picture in, the prices of 4k TV plunged significantly. In fact some of the 4k models we checked last year are now available for half of their launch price. Marketing using only 4k turned less tangible and now TV manufacturers shift focus on marketing through HDR (high dynamic range) and WCG (wide color gamut). 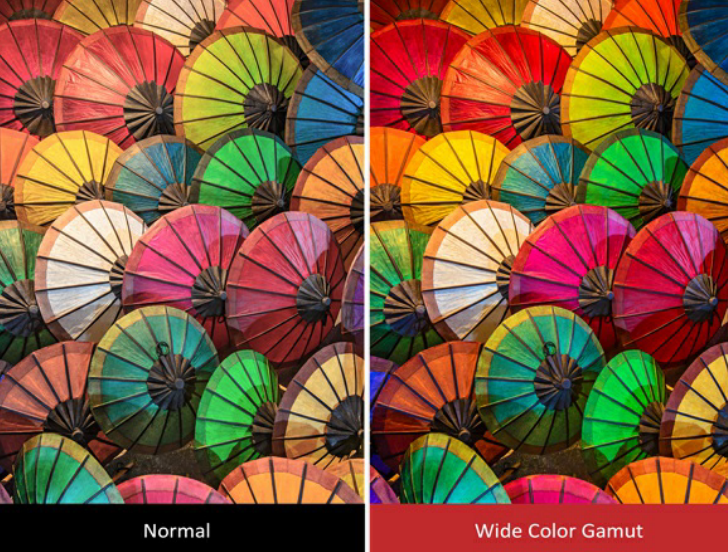 Wide color gamut is often bundled with HDR. Though mostly concurrent they aren’t exactly intrinsically interlinked. Where HDR increases the dynamic range of the picture (with brighter brights and darker darks), WCG improves on the color reproduction–redder reds, bluer blues, greener greens etc. In short HDR improves picture clarity quantitatively while WCG does so qualitatively. A color gamut is a range of colors found in a visual spectrum. It is also known as color space. RGB i.e red green and blue are considered as three primary colors and rest all the colors we see are result of combination of these three or are shades of these three colors. In color gamut there is one variation of each of these three colors: red, green and blue. Color gamut is created and updated by CIE. CIE stands for Commission Internationale de L’Eclairge (French name) is an organization which works for standardization of colors. Color gamut standardization helps in establishing concrete specifications for what the TV should do with colors. To meet a given color gamut’s specifications, a TV must be capable of displaying all the colors included in that color space. 4k resolution has brought more pixels to the TV. Now, the next logical step is not the mindless addition of more pixels but to improvise on those pixels. Improving pixels would give picture more definition and arguably most important–better color reproduction and wider color range. This is where WCG along with HDR spells the magic on the television screen. This is why you’ll see WCG and HDR challenging 4k and UHD for prominence on booths at TV exhibitions and even in new TV advertisements. First, it makes the color palette itself bigger. This way primary colors: red, green and blue are more deeper and secondary colors: magenta, cyan and yellow are much more richer. Next, it increases the bit depth. Now, the bit depth signifies how many steps of each color a TV has available; as in more shades between turquoise blue to dark blue. More shades of color translate to more color in totality. Where an ordinary HD TV would display 16 million colors WCG-capable TV would display 1 billion colors. Thus just like HDR extends the dynamic range by bringing in the dynamics of luminance, WCG brings out more color vibrancy on a TV screen because it can store a wider range of color values than covered by a ordinary color space. Wide color gamut is another step towards improving the aesthetics of watching a content on a television. TV’s WCG signifies the extended range of color coverage TV can display. This feature is only useful for HDR content and preferably in a 4k resolution. With all that in place WCG would surely enhance your TV viewing experience.